Seeing the light of day in 2015, Where’s the Gold free slot by Aristrocrat is a great online slot that has all the needed elements to give the players who enjoy it a great gaming experience. It perfectly combines the true Vegas style that made Aristocrat so popular with modern features and graphics to create a great slot. The layout and graphic design of Where’s the Gold are perfectly combined with its theme and will really make you feel like one of the gold diggers back in the 19th century. The reels are filled with thematic symbols such as digging tools, a carriage full of gold or the entrance to a gold mine. 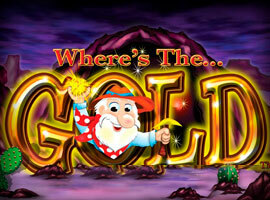 But speaking of symbols, the most important one of Wheres the Gold free pokies is the scatter. Represented by a bunch of dynamite sticks, getting 3 of these on a winning payline will bring you up to 10 free spins with the option to re-trigger the free spins during one feature. So, all you have to do is push the 25 paylines and 5 reels to the max and get a lot of winning combinations out of them. First of all, you should be aware that a lot of online slots can be enjoyed without spending 1 cent. How’s that possible, you ask? Well, Pokiestar aimed to build a strong database of free slots that players can enjoy in order to be prepared when they switch to real money play. And when you’re ready to do so, make sure to choose an online casino that also offers you a great bonus for your activity. The standard in the industry seems to be a 100% bonus and you can get just that at casinos like Gday Casino, Jackpot City or All Slots casino. You won’t have to get dirt on your hands while playing Wheres the Gold slot machine, all you need to do in order to get rich here is be patient and adjust your gaming strategy. If you still feel the need to play for free, visit Pokiestar right now and practice some more.